Please feel free to bring your favorite dessert which will be shared during fellowship time following the services, at which time you may meet new acquaintances or reminisce with old friends. Hope to see you at these Sunday evening services to keep this summer tradition alive. Gilmanton’s 120th Old Home Day is Saturday, August 18, 10 am to 3 pm on the grounds of the Smith Meetinghouse. Gilmanton’s 120th Old Home Day program is dedicated to Florence Geddes, life-long resident and poet. 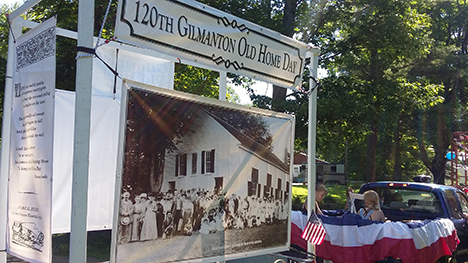 Gilmanton celebrates the Town’s 120th Old Home Day on Saturday, August 18, beginning at 10 am. Enjoy a traditional bean-hole bean dinner, complete with coleslaw, ham, brownbread and home-made pie for dessert. First sitting at 11:30 am, second at 1 pm. Features of Old Home Day include an antique car parade, tug of war, silent auction, children’s games, and more. The traditional art show will be found in the basement of the Smith Meetinghouse and a kids’ art display in the Meetinghouse passageway. An exhibit of Old Home Day decades past will be in the Smith Meetinghouse Schoolhouse. Find local crafts and other attractions while enjoying Bluegrass music by the Park Hill Road Band. The event takes place on the grounds of the Smith Meetinghouse on Meetinghouse Road off Route 140 between Gilmanton Corner and Gilmanton Iron Works. Admission and parking are free, and all proceeds go to preservation of this historic site and restoration of the five buildings that comprise the Meetinghouse complex. The Gilmanton Fire Department will receive $47,620 from the Federal Emergency Management Agency (FEMA) for an Assistance to Firefighters Grant (AFG). The grant will be used to purchase a new air compressor / air refill station to be used by Gilmanton firefighters in refilling their breathing apparatus tanks.